Kathleen is the blond lady in the middle in the vest near Howard Vlieger at Mother's Market. It was after 9 pm on election night and I was standing on the sidewalk outside of Mother's Market after the Prop 37 loss, sobbing. I held my face in my hands, and my body shook as I hiccuped breaths of night air. Suddenly, a blond peppy lady came rushing over. We had met briefly inside but suddenly she was saying with the familiarity of a long lost best friend," It's not over, it's just the beginning! Don't worry, we are going to do this! In just a couple months all of a sudden millions of people said Yes to labeling! We can do this!" She patted my shoulder and I looked at her with a flicker of hope. How could she be so optimistic? I thought I was...but this woman, whom I have grown to know, love and admire literally was my beacon of hope that night. She called to me with her faith and pulled me from the depths of despair. Kathleen Kelly Hallal is an Irvine Mom, like you and me...busy.. three boys, Den mother, PTA member, Mom extraordinaire and yet ordinary too. She just loves her kids as we do. She grew up in CA but spent a lot of time in the farming communities of Northern Idaho. She gets the value of of a farmer and the important of how food is grown and raised. I have to say I didn't totally get it at first when, over the next few weeks of getting to know her after the election loss, she cooked up the idea of hosting Howard Vlieger, a 3rd generation Farmer from Iowa come talk to the OC about food, farming and health. I seriously wondered, how are we going to get Moms to care what a farmer has to say? Our culture is so removed from farmers....they are like the designers of our clothes, we hear about them and know they are doing something good but we never see them and don't ever expect to. We don't need to know how our clothes are designed, we just want to wear them.Same with food. But Kathleen had seen his talk, and it had made a huge difference for her and her family. See, one of her three boys, who was excelling in school, suddenly, in 2nd grade began acting very strangely. He hid under his desk at school, lost his ability to right or draw, forgot his math and wouldn't listen or follow the simplest of directions at home. His behavior was completely different from who he used to be and all their doctors wanted to put him on medications that Kathleen was just not going to accept. Finally a therapist said "If you take his tonsils out, I think this will go away." Kathleen though she was crazy, but after further blood testing and discovering that he had an imperceptible ( from swab tests and sight) STREP infection which was impacting his brain and behavior. It is called PANDAS. Pediatric Autoimmune Neuropsychiatric Disorders Associated with Streptococcus. They removed his tonsils, put him on antibiotics and he got completely well. They have their happy, successful boy back! But Kathleen was of course committed to keeping him healthy and using antibiotics as little as possible, so she researched nutrition madly, and went to Howard's talk in October. There she learned that genetically modified foods, because they occur as a foreign protein in the body, weaken the immune system from constantly trying to keep the foreign protein out. When the immune system is weak from fighting off these foreign proteins, it cannot fight off other bacteria like STREP as easily as it once could have. Infections become stronger and our kids are become sicker and their behavior and ability to perform tasks are being affected. Further blood testing also showed her kids had 26 different food intolerances, in addition to a serious peanut allergy, which also are caused by the immune system reacting to what they perceive as foreign proteins a weakening of the immune system. These intolerance's did not show up as rashes, they were invisible on the outside. But on the inside her son's immune systems were struggling to fight these foods as they were unknowingly exposed to them and surely attributed to their irritability, inability to focus or make good decisions. When a body is in defense mode, the person is going to feel out of sorts and defensive, maybe even aggressive. She also learned that Glyphosate ( the active chemical ingredient of Roundup herbicide) which is being sprayed on many GMO crops, kills off good bacteriain the soil Glyphosate also promotes the growth of opportunistic organisms in the soil which causes more disease in the GMO crops. This leads to the development of molds and mycotoxins in the environment and the grain raised for the food supply. These micotoxins even at very minute levels cause a wide range of health problems to those eating the grain or foods made from this grain. Whether it is our kid’s breakfast cereals, chips or tortillas. So on top of a weakened immune system from the GMO foreign proteins, they are getting inundated with bad micotoxins, molds and potentially super bugs in the environment. The rates of kids with walking pneumonia have skyrocketed according to her pediatrician and bugs like MSRA are killing our children. GMOs are attacking our kids. A whole generation of children, whose immune systems are much more susceptible than adults, are being experimented on, and their health, moods, relationships, confidence, behavior and performance in school is being affected...some without visible physical symptoms. Since Kathleen learned this, she has had her children largely on a GMO Free diet and has seen remarkable improvements. She has heard of many children who have had sudden erratic behavior changes and inability to perform in school and they parents are convinced to put their kids on drugs or even lock them in psych wards. She believes a blood test of underlying STREP may explain and resolve this behavior. So she is committed to educating and empowering Moms Across America about this condition and the solution. 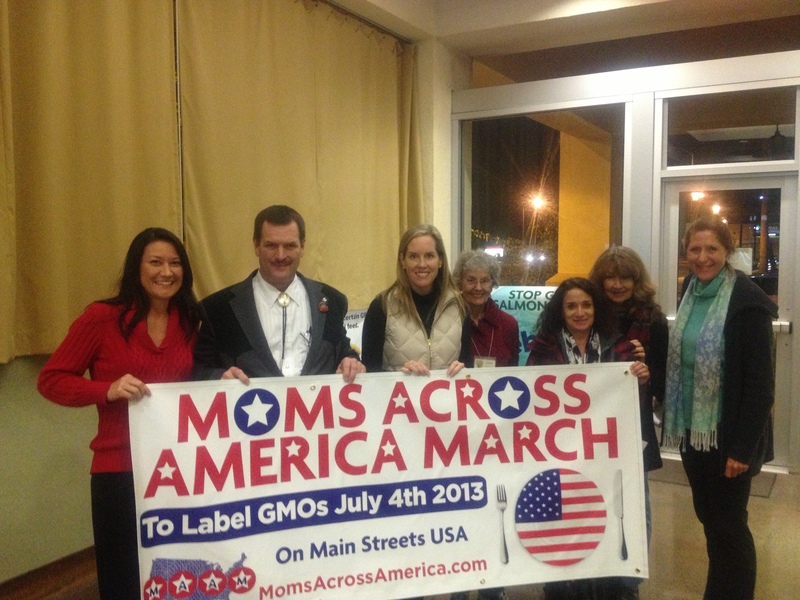 To do this, Kathleen went to extraordinary measures and sponsored/hosted farmer and GMO expert Howard Vlieger to come to Irvine, and Orange County and speak for 6 days. She made calls for weeks and scheduled speaking engagements at PTAs, schools, Moms groups, an Ecology center and many more . She arranged for a video to be made and a restaurant to host a talk. She drove him to every single speaking engagement, 17 in all, 5 in one day some days, spoke to the Moms about PANDAS and GMOs, and provided pamphlets at her own cost. She managed lunches, sports and even brought her kids to Howard's talks ( and they asked when he was going to speak to kids?). She was tireless. After seeing Howard's talk I got why she wanted this farmer to speak to American Moms. His perspective is groundbreaking. Her generosity and commitment to bring his perspective to us is exactly what is going to transform the future of food from one that is making our kids obese, have weakened immune systems, burdened with allergies and behavioral challenges, to one of healthy happy and successful kids who can eat organic food where ever they go on life's adventures. Because the greatest gift a Mom can give is to let go and bless their children's adventures in the world... and Moms like Kathleen are doing whatever it takes now to ensure that that world is one where they can thrive. Thank you Kathleen! And thank you to Tom, her supportive husband and three understanding boys.